The excavation season at Rocky Clump, Stanmer continued until December 31st 2005. The season has been very productive and the field unit has excavated a new section measuring 10 metres by 4 metres. The excavations revealed a mass of inter-cutting pits with a large north/south ditch cutting through the whole area. The pits were numerous and there was extreme difficulty in recording all of the various cuts and fills. Some of the large pits overlay smaller pits located in their lower depths. The finds have been less numerous despite the size of the pits, which brings into question the exact purpose of the features. The pits are all located on the east side of the ditch with only two of the larger pits actually cutting into the chalk on the west side (see picture). The bones team were particularly active in recording the bone deposits. The bones are concentrated in the lower reaches of the upper fill of the large ditch. There is no real evidence for ritualistic deposition and it appears to be a very random rubbish layer. A new trench was opened within the copse of trees at Rocky Clump to examine the possible 'shrine' features known from a series of very large post holes revealed in the 1960's excavations. The new trench is within the precincts of the shrine and it has revealed a rough chalk elevated platform. The area has been badly disturbed by rabbits and tree roots. The area produced some pieces of dressed sarson stone and chalk blocks, but only a single piece of East Sussex Ware pottery. It is planned to extend the trench into the shrine interior to try and determine whether the chalk platform is a deliberate floor level or a collapsed chalk wall. A new trench has been opened to the north which is already into deep archaeological layers. A geophysical survey last year showed a large area of low resistance indicating the location of a substantial pit. This large pit links to another large ditch further north. The new are area has already produced a badly corroded Roman coin, It is planned to extend this trench during the 2006 excavations. This year we were joined by the Brighton and District Metal Detecting Club who conducted a metal detecting survey of fields around Rocky Clump. The adjacent field is called Iron Square and according to the detectorists it is aptly named. There were no spectacular finds this season, but a number of interesting lead pieces were collected. The group will be working with us in the 2006 season. Rocky Clump is still proving to be a very interesting site and another season will begin around May 2006. The Young Archaeologist Club, (Y.A.C. ), have already booked their visit to the excavations. Members of the BHAS Field Unit have been assisting County Archaeologist, Greg Chuter and Bob Washington (MSFAT) with excavations at Arlington. The site is in a field opposite the pumping station at Arlington Reservoir, the farmer kindly left part of the field un-ploughed so that excavations could take place. Evaluation trenches have uncovered a section of Roman road with its associated ditch to the north side. Post holes found on the south side of the road show signs of settlement abutting the road. A small trench in the ploughed area to the south of the road was placed over an area of burning shown up by ploughing. At first it was thought that this trench had been placed on top of a pit but it now appears to be a small boundary ditch. 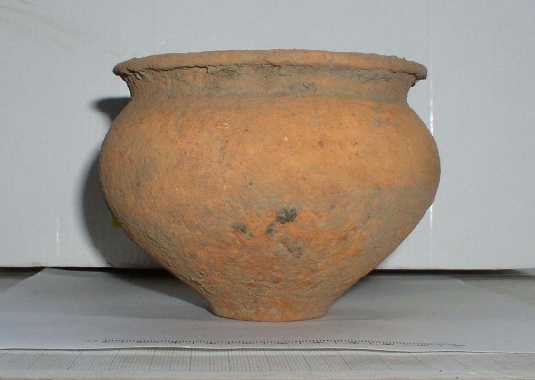 This trench has produced large amounts of Romano - British pottery including two whole pots (see picture) and one in two or three pieces, these are thought to date from the 2nd century AD. The same trench also produced a coin of the 1st or 2nd century, Another trench at the edge of the ploughed area also produced large amounts of pot and a large piece of what appears to be iron slag with a pottery sherd embedded in it. Also found were two possible pottery wasters indicating the site may contain a kiln. Excavations have now come to an end to allow the farmer to plough and plant his crop. Greg and Bob are planning to return to the site in October of this year once the crop has been harvested. This time it is intended, with the help of a mechanical digger, to open up a large area rather than small evaluation trenches. 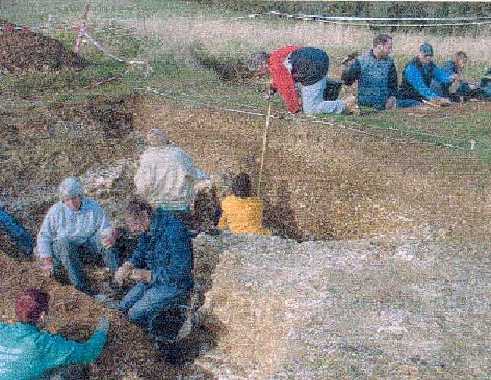 The BHAS Field Unit are planning to return to Hog Croft field at Ovingdean in the early part of 2006. The small scale excavations will investigate two areas in the field. An area of slight depression may be the location of a medieval 'detatched' kitchen. The kitchen would be associated with the medieval manorial complex found during previous seasons. Another area to be examined is a large circular area of high resistance. A small section 1 metre wide was cut across the feature in 2002 and produced a massive conglomeration of flint, building rubble and the curved edges of a pit cut into the chalk. it is possible that this is the location of an ancient dove-cote, often a facet of medieval manors. The best preserved example of a standing manorial complex is at Alciston, near Berwick. The season will last for about 6 week-ends and will be open for public visits. In the summer of 2005 the BHAS, Brighton and District Metal Detecting Club and Liz Wilson, Sussex Finds Liaison Officer, took part in the filming of a BBC programme. The programme "Inside Out" was about "Nighthawks" and the illegal plundering of sites by a small minority of metal detectorists. The segment filmed at Rocky Clump aimed to show the co-operation between archaeologists and metal detectorists working together on site. John Funnell gave a 10 minute interview to presenter Kaddy Lee Preston (see picture) emphasising the co-operation between the two groups. Unfortunately all of this ended up on the cutting room floor!